Of the more than 3,700 species of spiders in the United States, only about a dozen are considered medically important. Those species fall into two groups, the brown spiders (Loxosceles spp.) and the widow spiders (Latrodectus spp.). Several species of brown spiders, also known as violin or fiddle-back spiders, inhabit the southwestern United States. But the brown recluse (Loxosceles reclusa) occurs in roughly the southeastern quarter of the country, and is by far the most common and widespread of the brown spiders. Three species of black widow spiders are widespread in the United States. 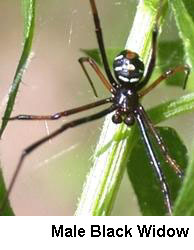 The black widow (Latrodectus mactans) inhabits the southern half of the country. Most common in northern states such as Illinois is the northern black widow (L. variolus) which is replaced in the Southwest by the western black widow (L. hesperus). True to its name, the brown recluse is both brown and reclusive. 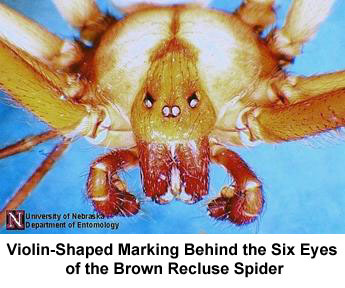 The body of an adult brown recluse is light brown, except for a darker, violin-shaped marking on the back, immediately behind its eyes. This mark helps identify the spider, though it develops as the spider does and is not present in young brown recluses. An even more important identifier is the number and arrangement of the eyes. Unlike most spiders which have eight eyes, brown recluse spiders have six eyes arranged in three pairs. Note also that the legs of brown recluse are not spiny or banded like those of many spiders it is often confused with. While females build flat, sheet-like webs, or “retreats,” that may help them capture prey, the brown recluse should be thought of as a hunting spider because males, in particular, roam in search of prey. Brown recluse are most active at night. During the day they rest in hidden locations within the structures they infest. They are fond of building their retreats and resting on wooden surfaces, such as inside furniture, cardboard boxes, wall voids and in the wood framing of crawlspaces, basements and attics. They are not often found far from structures. Most infested structures did not become so by brown recluse traveling over land from one house to another. Moreover, brown recluse do not “balloon,” that is, they do not use silk strands to disperse by wind as other spiders do. Most structures become infested when brown recluse “hitchhike” indoors on furniture, boxes and other items from infested structures. The spiders are well-adapted for establishing themselves by hitchhiking. They are long-lived, can go for many months without eating, and are adapted to the hot, dry conditions found in many structures. What’s more, a female brown recluse needs to mate only once to produce eggs throughout her life, and can produce 150 or more spiderlings in a year. Thus, a single female hitchhiking into a structure is all it takes to establish an infestation. The need to inspect items before moving them in is clear. Once established within a structure, brown recluse are often difficult to control. Though hundreds of brown recluse may be present in a house, they may not be easily observed because of their reclusive, nocturnal habits. 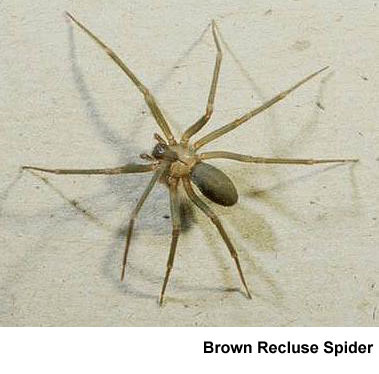 Even when exposed, brown recluse are fast runners and difficult to catch with a vacuum cleaner, fly swatter or shoe. Successful brown recluse control requires an integrated management plan that utilizes several control methods. Management plans employing only one means of control, such as spraying baseboards, will fail. One valuable method is to deny the spiders access to hiding places. Typical hiding places include garages, crawlspaces, attics, wall voids, cracks and voids around fireplaces, cabinets, furniture, boxes and stored goods. The importance of eliminating clutter from the structure cannot be overemphasized. Boxes and other items stored for long periods of time are ready harborages for brown recluse. Stored goods should be eliminated or placed in plastic bags, tubs or other containers that seal tightly. Cracks and crevices should be sealed with caulk, expandable foam, weather stripping, screen or other materials to prevent the spiders from entering them and gaining access to structural voids. Seal around fireplaces, vents, door and window frames, crawlspace and attic doors, and where cabinets, counters and baseboards meet walls, to permanently prevent brown recluse, and other pests as well, from harboring there. Another invaluable method essential to victory in any war against the brown recluse spider is the use of sticky monitors. Also known as sticky traps, they consist of a small piece of cardboard covered with an adhesive the spiders walk on and become stuck to. Some sticky traps fold into little boxes or triangles that help to cover and protect the adhesive from dust and dirt. Sticky traps stop brown recluse “in their tracks” and help control other pests the spiders may use as food. Keep the traps out of the reach of pets and small children. Place them on the floor against walls, behind furniture and in other out-of-the-way locations where brown recluse are likely to travel. Sticky traps can be purchased from lawn-and-garden centers, hardware and discount stores, pest control companies and distributors, do-it-yourself pest control suppliers and the Internet. 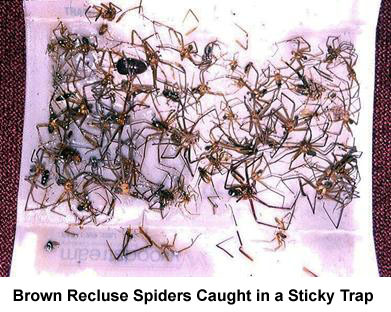 Though sticky traps may be less than attractive in your living room, you cannot use too many of them. Using 50 or more in the average home should not be considered excessive. The more traps you place, the more likely you are to catch the spiders. Not only do the traps kill brown recluse, they also help pinpoint “hotspots” of brown recluse activity – places to focus control efforts on, such as pesticide applications. Pesticides are often a necessary part of brown recluse management. Applications should be targeted on cracks and voids – where brown recluse are known or suspected to be. A larger volume of pesticides may be called for in infested crawlspaces and attics, or around foundation perimeters when brown recluse are found living around a structure’s exterior. Encapsulated formulations of residual pesticides are effective in this role. Also, some dust formulations (pesticides in powdered form) are a good choice for treating spaces such as wall voids. The use of aerosol foggers is generally ineffective because brown recluse may be hidden so deeply inside items that the “fog” cannot contact them, and those spiders that are contacted may not be killed but driven deeper into hiding. Directed space treatments, where the fog is injected into voids, may achieve better results, though this type of treatment typically requires professionals using specialized equipment. Eliminating brown recluse spiders from an infested structure may take months. Time to elimination depends on the type of structure, the indoor environment and, of course, the effort put forth in trapping and locating the spiders, cleaning and sealing their hiding places, and applying pesticides effectively. The bad news is that it may be virtually impossible, short of an expensive fumigation of the premises, to completely eradicate brown recluse from some structures. The good news, such as it is, is that persons living even in heavily infested structures are very rarely bitten by brown recluse. Perhaps no other American spider has fostered so many myths and misrepresentations as the brown recluse. Misunderstanding and misinformation about the distribution and prevalence of the brown recluse is often as exaggerated as the imagined consequences of the brown recluse’s bite. The spider’s reputation has suffered at the hands of uninformed public, media, pest control operators and physicians. Brown recluse do bite people. And the bites can result in serious medical complications including disfiguring wounds. Yet bites are uncommon – even though brown recluse are common in some parts of the United States. The spider is, after all, reclusive, not aggressive toward people, and prefers to run rather than bite. This explains why people can live in a house with thousands of brown recluse, without being bitten. Bites typically occur when the spider is trapped between the skin and clothing or bedding. Therefore, clothing and bedding, especially those that have not been used for awhile, should be inspected prior to use in infested structures. The recluse’s largely undeserved reputation often comes to mind when brown-colored spiders are discovered in the home, or when nasty-looking skin lesions appear. It’s estimated that the majority of spider bites diagnosed as “brown recluse bites” are actually attributable to other medical conditions. The frequent misdiagnosis of necrotic injuries is evident in numerous reports of brown recluse bites from areas not inhabited by brown recluse. Brown recluse are extremely rare outside their known range (see illustration), yet “brown recluse spider bite” remains a catch-all diagnosis for necrotic wounds. Diabetes, impetigo, Lyme disease, tularemia, cutaneous anthrax, necrotizing fasciitis, Staphylococcus aureus infection and other maladies can produce necrotic wounds that resemble brown recluse bites, making diagnosis difficult or impossible without witnesses to the bite, collection of the spider, and its identification as a brown recluse by someone familiar with the species. Note: The brown recluse has been collected in other areas (e.g., in northeastern Illinois) but should be considered rare outside its range as shown above. Many brown recluse bites result in only redness and swelling around the bite and are no more serious than a bee sting. The severity of the wound may depend on the amount of venom injected. Male brown recluse probably account for most bites because they roam more than females and are often encountered. Males possess about half as much venom as females, and may produce bites that are less severe. Most brown recluse bites do not result in the large, necrotic wounds often depicted as the typical outcome of brown recluse bites. More severe necrosis probably occurs in less than 10 percent of cases. Horrific tales of rampant necrosis from brown recluse bites causing the amputation of arms, legs and noses are undoubtedly exaggerations or attributable to uncontrolled bacterial infection or other unrelated conditions. Death from brown recluse bites has been reported, but is extremely rare and probably occurs only in very young or infirm individuals. The brown recluse’s bite is usually painless and not felt by the bitten person. Symptoms of the bite vary but generally include the following: redness, swelling and a burning sensation developing around the bite within one hour. The red area may enlarge over the next eight hours, and the bite may blister to resemble a bad pimple. Within 24 hours the wound becomes a hardened lump up to 2 inches in diameter, and a scab forms. The wound typically heals within eight weeks. If skin around the bite becomes purplish, necrosis is likely. If necrosis occurs, it usually does so within four days of the bite. Systemic involvement rarely develops but may include fever, nausea and cramps. Not all widow spiders are black. But in the United States, adult females of the three most common widows are almost always a shiny black. The familiar “hourglass” marking located on the underside of the female’s bulb-shaped abdomen is bright red or red-orange. 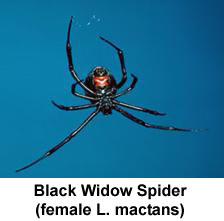 In northern black widows (Latrodectus variolus), the upper and lower halves of the hourglass are separated into two red spots, while the marking on the southern black widow (L. mactans) is represented by a single, red, hourglass-shaped mark. There is, however, considerable variation among individual widow spiders. Some have no hourglass markings. Most have a smaller red spot near the tip of the abdomen. There may be a line of red spots on the upper side of the abdomen, and northern widows often have white streaks on the sides of their abdomens. Adult female widow spiders have bodies up to ½-inch long. Much smaller are the male black widows and immature females that are gray to brown with spots and stripes of red, orange and/or yellow on the upper surface of their abdomens. Contrary to popular belief, a male black widow is not always eaten by the female after mating. Some males live to mate another day. Females can live three or more years. Mating occurs in or near the female’s web which is irregular in shape except for a short funnel-shaped portion in which the female hides. The webs measure about one foot in all directions and are typically found in dark, sheltered spots such as in animal burrows, around the bases of rocks, bushes, woodpiles or around the foundations of structures. Egg sacs are often seen in the webs. The sacs are about the size of a large pea and usually contain more than 200 eggs. The spiderlings that hatch from them disperse to new locations by extruding a long strand of silk that is taken aloft by the wind, a process known as “ballooning” that can transport the baby spider to locations several miles away. 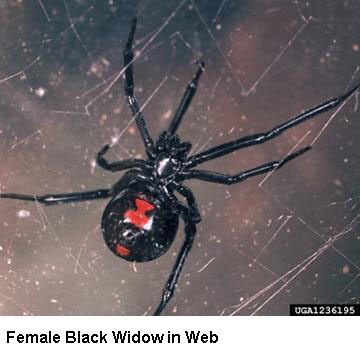 Because of their habit of remaining in webs that are purposely built in out-of-the-way locations, bites from black widows are uncommon. Bites may occur when fingers or toes, for example, are stuck into the spider’s web. But black widows usually prefer to run away rather than stand and fight intruders. Most bites occur when the spider is actually touched or pinned against something. Male widow spiders are not considered dangerous. The bite of the female black widow is often felt as a sharp pin-prick. The neurotoxic venom typically causes chest pain, muscle tightness and cramping. Pain may spread to the person’s abdomen. Swelling can occur in the extremities but rarely around the bite. Other symptoms have been recorded but are less common. Symptoms usually begin to decline after 48 hours and are gone within five days, but milder symptoms may persist for weeks. The more severe symptoms may not occur, and many people bitten by widow spiders do not require treatment of any kind. Bites very rarely result in death. Children and the infirm are at greatest risk for complications. Denying widow spiders a place to build webs can help prevent them from coming in contact with people and pets. Filing holes and voids, sealing cracks and crevices, reducing outdoor lighting (so as not to attract insects on which the spiders feed), keeping vegetation away from structures and disposing of outdoor debris helps make an environment unfavorable to spiders. Controlling black widow spiders also involves inspecting structures and yards for the presence of the spiders and their webs. This is best done at night because black widows hide during the day and hang in their webs at night. Like other cobweb spiders, black widows can be dispatched by vacuuming, if care is taken not to release the spiders when emptying the vacuum cleaner. Smashing them with fly swatters, boards and shoes will work as well, as the spiders are not aggressive and cannot run away fast. Treating them directly with a contact pesticide is another option. Lastly, applications of residual pesticides, such as wettable powders or encapsulates, to crawlspaces and around foundations can also deter these and other types of spiders. Images and illustrations courtesy of United States Fish and Wildlife Service, University of Nebraska, University of Kentucky, and Richard Vetter -- http://spiders.ucr.edu. For more information, contact the Illinois Department of Public Health, Division of Environmental Health, 525 W. Jefferson St., Springfield, IL 62761, 217-782-5830, TTY (hearing impaired use only) 800-547-0466.